The Field Studies Council published this year a new guide to the ‘identification, understanding and control’ of the Slugs of Britain and Ireland (Rowson et al. 2014). Running to 136 pages, it has keys, detailed descriptions and magnificent coloured photographs of the 46 species of slugs and semi-slugs currently thought to occur here. Having acquired a copy, I thought I would try to improve my knowledge of the local slug fauna. However, identification was not always straightforward. On 23rd November, I turned over a piece of timber near the pier at Culkein Drumbeg (NC1033) and collected a sample of what appeared to be at least four different species, mostly quite small in size (c.20-30 mm). Under a stone nearby was a rather more substantial specimen, pale orange, with a striped fringe to its foot. I put tentative names to them and than sent the whole lot off, carefully packaged to keep them alive, to Dr Adrian Sumner at North Berwick, who is the nearest expert on land and freshwater molluscs. His comments were very helpful and I was pleased to find that I had correctly identified at least some of them. A pale, active species, 35-50 mm long, with a network of dark marks on the tail, was the very common netted field slug Deroceras reticulatum. It is widespread in all but the centre of the Highlands, and is recorded from 9/10 of the main hectads (10 km squares) encompassing Assynt. It can be a serious pest, attacking plants both above and below ground. A dark, active species, 15-25mm long, was the widespread marsh slug Deroceras laeve. It is widespread in moist habitats in the Highlands, especially around the coast, and is recorded from 7/10 Assynt hectads (but not NC13). An equally dark, active species, 25-35 mm long, but with a pale margin to its breathing pore, was the tramp slug Deroceras invadens. There are scattered records from the Highlands, mainly coastal, including 3/10 Assynt hectads (but not NC13). I have also had it from our vegetable garden at Nedd (NC1331). A slightly larger, slow-moving species, 30-40 mm long, with darker bands along both mantle and keel, was the silver false-keeled slug Arion circumscriptus silvaticus. It is widespread in the Highlands, with concentrations of records in some coastal areas, including 2/10 Assynt hectads (NC21/22). A dark brown, slow-moving, medium-sized species, 60-75 mm. long, with a dirty orange keel which was very conspicuous when it contracted into a hump, was Sowerby’s keeled slug Tandonia sowerbyi. There are only eight previous records from the Highlands, and just one from Assynt (NC22). It can be a pest in gardens and arable fields. The much larger, pale orange specimen, from under a nearby stone, was more difficult to identify. I thought it might be a sub-adult large red slug Arion rufus, closely related to the almost ubiquitous large black slug Arion ater. However, after careful consideration, Adrian named it as another relative of both, the vulgar slug Arion vulgaris. This can reach 140 mm. when extended, and is characterised by a dark rim to the breathing pore and a dark sole. There are just six records for Scotland as a whole, only one of which is from the Highlands (on the east coast of Caithness), so a specimen from Assynt represents a considerable extension of the known range. The species is thought to have originated in southern Europe, was first definitely recorded from Britain in the 1960s, and appears to be spreading north. It is a notorious pest in Europe, but given the small proportion of Assynt now under cultivation, it is unlikely to be a problem locally. So, six species from a small area of disturbed ground. There would appear to be plenty of scope for further study of this aspect of our local mollusc fauna, since the known distribution in the Highlands is, almost certainly that of interested observers, rather than of the beasties themselves. However, the coastal bias in the records of many species may be real, because that that is where there is more relatively fertile ground. I have, incidentally, used the term ‘record’ to indicate the number of hectads from which the species is mapped in the new work; there may be more than one actual record from a hectad. My thanks, once again, to Dr Adrian Sumner for his help and encouragement. Illustration: two Arion species, from an earlier collection at Scourie (NC1544) on 15th November, both contracted to a near hemisphere. 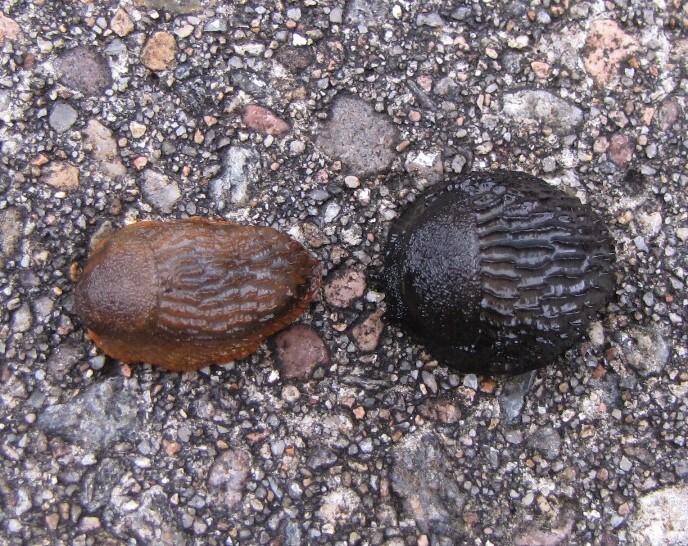 Left: a sub-adult specimen, probably of the vulgar slug A. vulgaris. Right: large black slug A. ater.